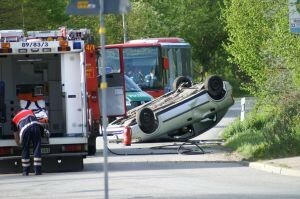 Some accidents are termed “freak accidents,” because they involve circumstances that we would not expect to see. According to a recent news feature from the Sun Herald, one of this “strange accidents” has resulted in the death of one person and the serous personal injury of two others in Mississippi. Authorities say this accident occurred when a car was propelled through the air, then hit the raised porch of a house, and then landed completely upside down in the woods. When emergency personnel arrived at the scene of this fatal accident, they initially could not figure out what exactly happened, and these are people who deal with deadly wrecks on a regular basis. The local police chief said it was so strange that he could only “hypothesize” about what happened. He believes three individuals were in a car headed eastbound, when the driver lost control of the car and veered into the ditch on the left side of the roadway. Authorities are not sure at this time why the driver apparently lost control of the car. Once the vehicle entered the shoulder, it is believed to have struck a large utility pole, causing the car to spin into a drainage ditch on the side of the road. When it hit the ditch and ran back up the sloped side, it was launched into the air. Somehow, the car flipped 360-degrees in a horizontal fashion in mid-air while flying over a car parked in a nearby driveway, without doing any damage to the parked car. After clearing the parked car, the car kept flying through the air until it hit the second story porch of the house at the end of this driveway. After crashing through the porch, the vehicle kept traveling through the air and ended up landing on its roof about 20 yards from the house with the porch. During its flight, the driver and one passenger were both ejected from the vehicle. The third occupant remained in the car. The passenger who remained in the car was pronounced dead at the scene of the accident. First responders treated the two occupants who were thrown clear of the vehicle and transported them to a local hospital, where they are listed in critical condition. Authorities said the vehicle was so heavily damaged that they could not even determine the make and model. When trying to make sense of what happened, the police found that the utility pole had been severed, and most of it ended up in the woods nearby the roadway. They are still not sure why and exactly how all of this happened and have no idea how the car in the driveway was not damaged. As our Boston personal injury attorneys can explain, some accidents will take a significant amount of investigation to determine if there was any negligence involved and if you have a valid personal injury case. Your attorney’s private investigator can assist with the investigation and check with the local police to determine what they have discovered. However, much of the evidence will not be easy to discover once some time has passed, so it is best to speak with an experienced accident attorney as soon as possible.